Virgin Mary waits for Jesus in a cave in Maghdouche near Sidon in the South of Lebanon now known as Our Lady Of Mantara (Awaiting). The village of Maghdouche is inhabited by 5000 Melkite Catholics. 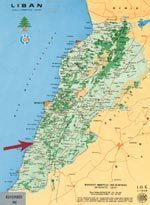 It is located on a hill south east of the Biblical city of Sidon where Jesus often preached. 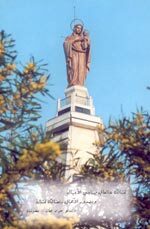 At the entrance of the village, there is a high tower with a statue of the Virgin on the top. This is the sanctuary of “Our Lady Of Mantara”. The main place of the sanctuary is a natural cave, where according to tradition, Virgin Mary waited for her son Jesus Christ while he was preaching in Sidon, a pagan Phoenician town where Jewish woman could not go. The old Roman road from Jerusalem to Sidon passed through Caesarea Philippi (now called Marjayoun) and through the village of Maghdouche. That is why it was called Mantara which means “awaiting”. The early Christians used to come to the cave which became a pilgrimage site ever since. 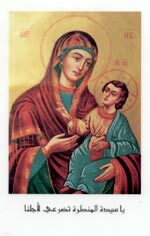 Empress Helena around 326 AD forwarded an Icon of the Virgin and Jesus as a gift from the Byzantine royalty, said to have been painted by St. Luke himself and also built a tower at the site. Later the Christians of Maghdouche fled away from persecution to the towns of Zahle and Zouk after carefully concealing the entrance to the ancient grotto with stones and vines. They did not return for a thousand years until the rule of a very great non-sectarian ruler, Fakhreddin II. However they could not locate the cave of “Our Lady of The Awaiting” although for years they probably worked close to it. It was later discovered accidentally by a shepperd looking for his goat that got lost in the grotto where the Icon was still kept. The elders knew from their ancestors that it was the cave of “Our Lady of The Awaiting” and they removed the Icon to the main church in the village. But the next day, the Icon was back in the grotto. 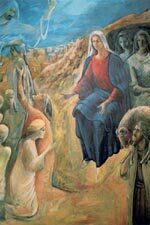 The Bishop of Sidon observed that the Lady did not wish the Icon to leave the grotto where it still lies. Today Lebanese and foreigners come here to meditate and worship. Our Lady Of Mantara (Awaiting) has long been known for protecting children and healing eye diseases.